Native to South America, angel’s trumpets are tropical-looking plants with big, trumpet-shaped flowers. The Sunset variety has variegated foliage and soft, apricot-colored blooms. Brugmansia Sunset requires moist soil with lots of organic amendments mixed in, such as compost or manure. Although they thrive in moist soil, these plants don’t like sitting in water; make sure the soil in the planting area drains quickly. 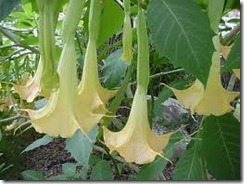 Plant the angel’s trumpet brugmansia Sunset in an area sheltered from the wind. If you live in a hot area, locate the plant in an area that will provide it with afternoon sun. 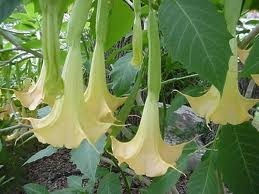 All parts of the angel’s trumpet brugmansia Sunset are poisonous, so plant it in an area where children or pets won’t have ready acess to it. Angel’s trumpets also attract bees — consider this when deciding on a location.